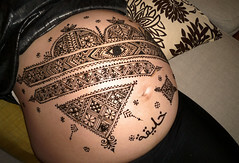 K’s Moroccan belly, a photo by kenzilicious on Flickr. What a pleasure to create something crazy and Moroccan on this big canvas. Pregnant bellies are so potent with possibilities that I find them a bit unnerving. 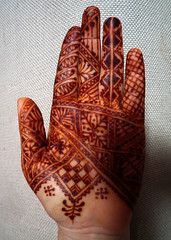 My creativity runs for cover at the sight of all this space; I try to coax it out of hiding by asking the clients lots of questions about what she wants from her henna design. My client’s instructions to me were “random and tribal stuff all over”. Confused, I tried to tease out more information until I realized that she wanted Moroccan designs. My client is a painter who has lived in Morocco and has been very inspired by Moroccan rug designs as well as henna. I went with the idea of Moroccan rugs–which I also love with a passion–specifically the bands of design that are a common feature especially in the kilims from the north of Morocco. I also wanted to stay away from a radial and centered design on her belly which is very common. I think that I definitely got the “random” that she asked for. I had a blast doing this design while pumping my client for information about her experiences in Morocco. She was thrilled with what I channeled for her and I hope that she and her baby will always be protected from the evil eye! I remember reading about Serfaty in Malika Oufkir’s book Stolen Lives. What a fascinating life he’s led and what a great loss to Morocco and the world. Nic and I LOVE Lalla Essaydi, we hope you will like her too! I really love these photos of my 2nd fave city in Morocco. The saturated colors accentuate the crowded, medieval city of Fez. It’s always nice to see the city from outside instead of being lost and hot and frustrated inside it. Can’t wait to get back there!